Great news! 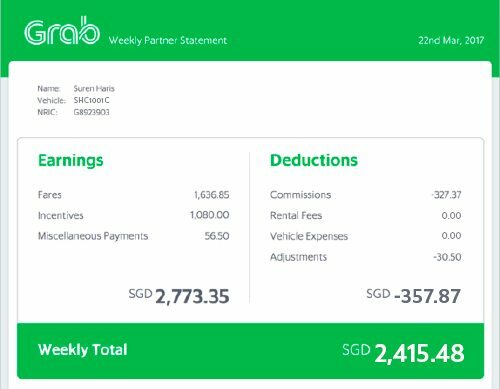 With our newly revamped Weekly Partner Statement, you can now track your earnings and expenses with ease. Instead of waiting till the start of the next month, receive your GrabTaxi Partner Statement on every Wednesdays. As usual, it will reflect your previous week’s activities. But because you receive your Statement sooner, all activities are still fresh in your mind! At the top of your Statement, you can expect to find an easy to read summary of your all Gross Earnings, Expenses, and Net Earnings for the past week. View all details in your monthly statements. Broken down into Fares earned from Cash Rides, and Fares earned from GrabPay Rides. Details of weekly incentive, and reasons for both qualified and unqualified incentives payouts. Payments for trips cancellations, no shows, goodwill, refund levy etc. Payment adjustments for levy, incentive and promo payment corrections (if any) etc. Cashout Requests within the week. Reimbursed monies for rides with promos. Breakdown of every trip performed with Grab in the previous week. Q: As a GrabTaxi Partner, what changes for me? A: You will receive a new Weekly Partner Statement, every Wednesday by 11:59 pm. The new Statement will show more details of your activity such as the summary of your earnings, deductions and your trip history from the previous week. It will include all payments and deductions from Grab. Q: I’m unsure about a payout made to my wallet. How can I find out what it is? A: Simply wait for your Weekly Partner Statement on Wednesday for more details.